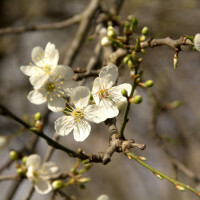 There are signs of spring across the farm as February comes to an end. 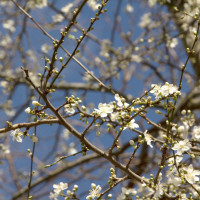 Spring bulbs in bloom, the first blossom on trees and songbirds among the still-bare branches. 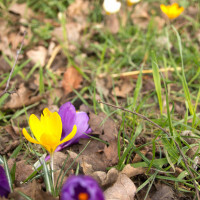 This month has seen Storm Doris and a real mix of weather including snow, hail, rain and bitterly low temperatures as well as bouts of warm sunshine. 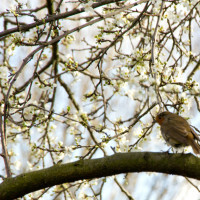 A robin among the cherry blossom. 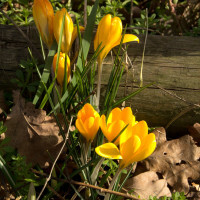 Keep an eye out for Spring bulbs! 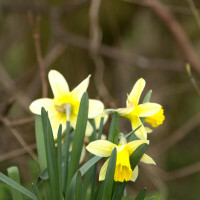 Daffodils are coming into flower across the farm. Basking in the warm February sun. 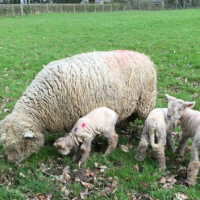 A warm welcome to Mudchute for the four new Southdown ewe lambs! 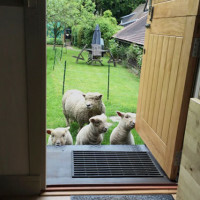 The girls join us from Tim and Lynn Morris’ Kitwell flock in Hertfordshire where they were born last April. The Morrises have kindly donated Emily, Esther, Esmeralda & Enya to Mudchute. 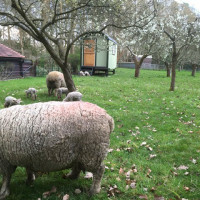 Thank you very much for these beautiful sheep, we are sure they will be very happy here at Mudchute! 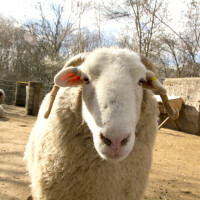 The ewes will be founding members of the Mudchute Southdown flock. 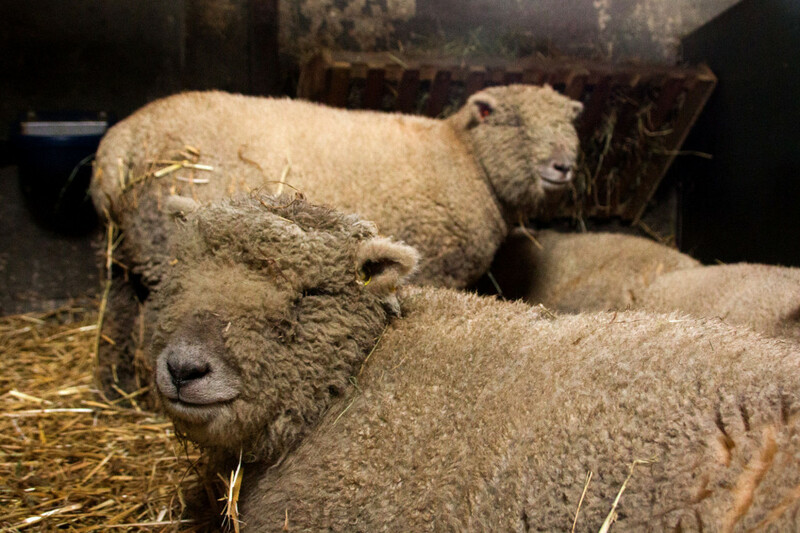 Southdown sheep are the oldest of the terminal sire breeds in the UK. 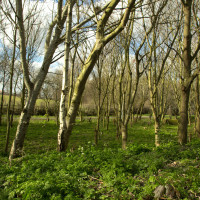 The breed traces its roots to the nearby South Downs of the South of England. 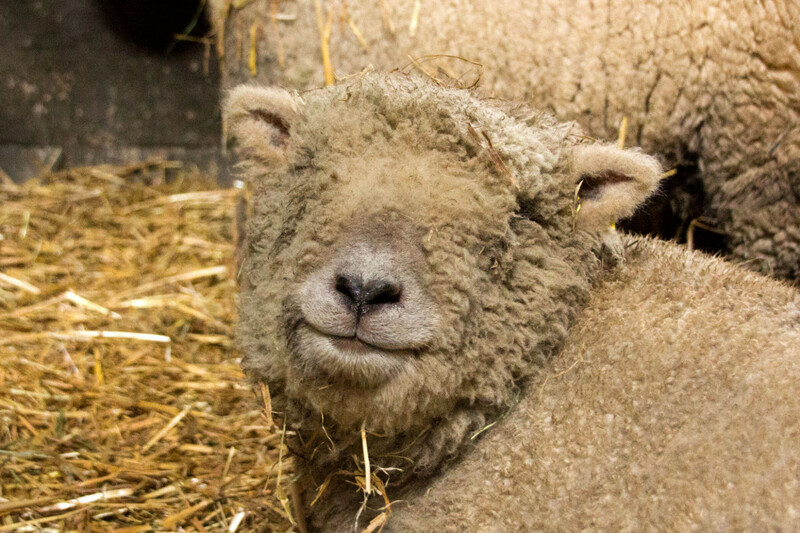 To find out more about this gorgeous “teddy bear faced” native sheep breed, you can find their brief history here and more about Southdown Sheep from the Southdown Sheep Society. 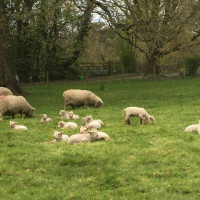 Here at Mudchute, the ewes will working with our lucky Young Farmers. 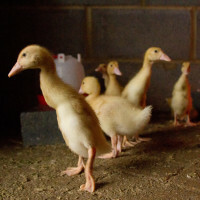 They’ll be settling in to life at Mudchute over the next week or so, but should be making their debut on our fields soon. So be sure to keep an eye out for these gorgeous new girls. 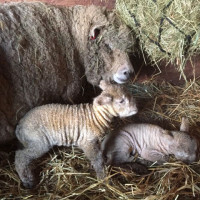 The Morrises have even been kind enough to send us some baby photos of the ewes. 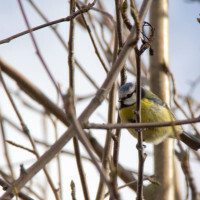 We look forward to sharing more photos as they settle into life here at Mudchute! Esmeralda as a new born lamb. 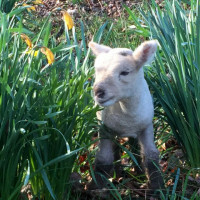 Enya among the daffodils at just a few days old. 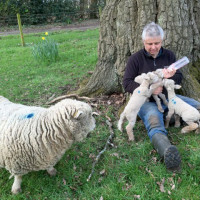 Farmer Tim Morris top-up bottle feeding triplets. Esther at just 1 day old with her mum and siblings. 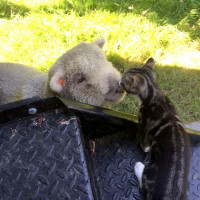 The Morris kitten Basil making friends with Esther. Curious Esther and her siblings visiting the office. A frosty morning in Hertfordshire. 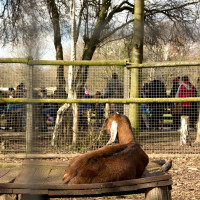 Hatching is underway at Mudchute, with the first of Spring’s arrivals making their way into the world. We welcomed our first ducklings last week. 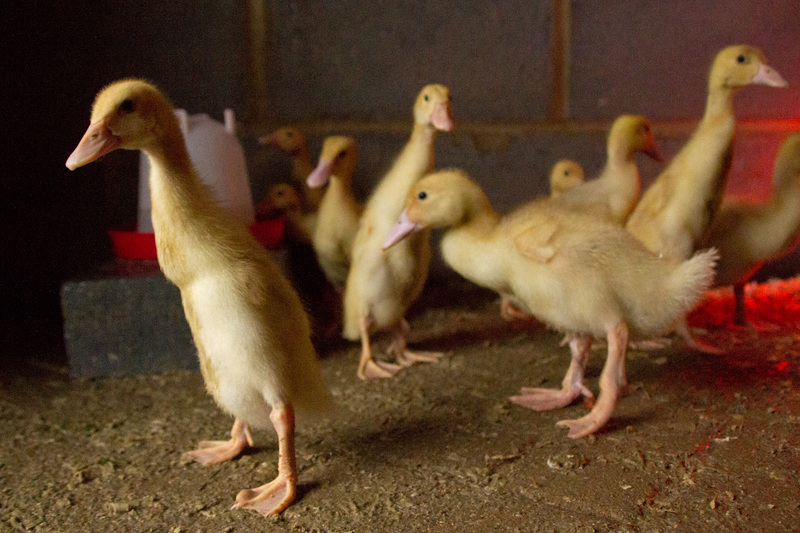 The newly hatched ducklings include a mix of Aylesbury and Runner ducklings and will be joined by further ducklings and chicks over the coming weeks and months. 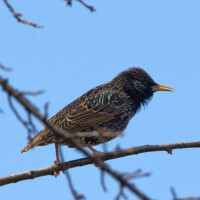 These precocious youngsters spend nearly a month developing in the egg and are capable of walking and feeding themselves shortly after breaking free of the egg. However, breaking the eggshell from within is hard work. 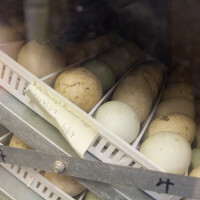 Chicks and ducklings first begin with an “internal pip” internally breaking into the air sac a the wide end of the egg, taking their first breaths. 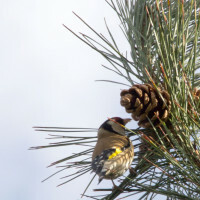 They then break the egg shell (an “external pip”) before they begin to unzip the shell. 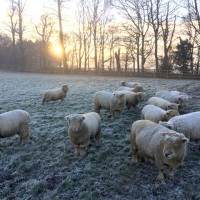 Watching the growth and development of the embryos is fascinating and we’ve shared some of the process previously here on the blog. We’re also happy to share the experience with local school groups who participate in our Hatch and Brood programme, where eggs are incubated right in the classroom. Good luck to all of our participating schools! To find out more about the programme including how your school can take part, please visit our Education pages. Eggs rocking in the incubator. 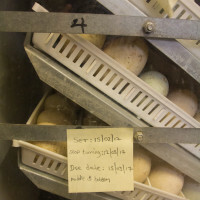 The incubator keep the eggs at the appropriate temperature and relative humidity as well as ensuring they are turned appropriately. 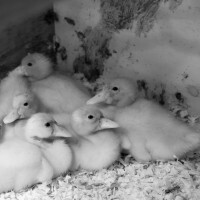 New ducklings under their heat lamp. 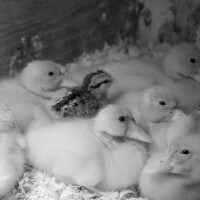 …and one extra Dutch bantam chick! 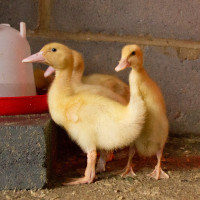 Older Aylesbury and runner ducklings find their feet. Can you spot the runner ducklings? 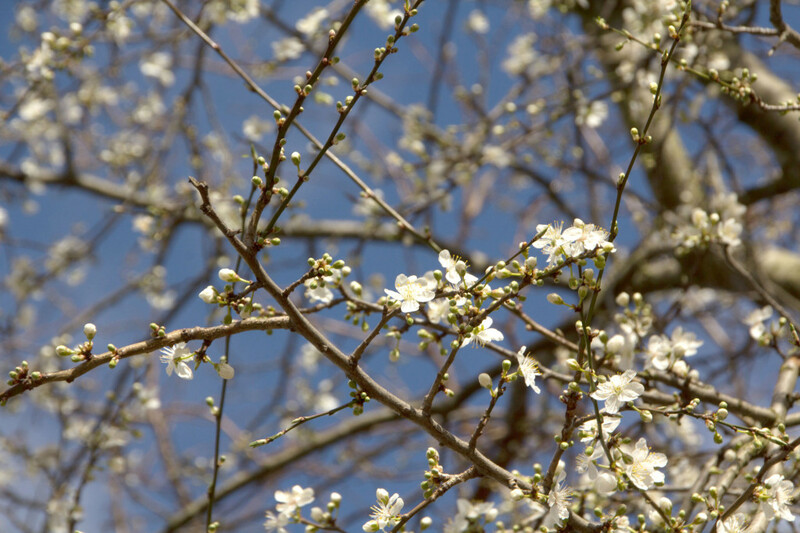 They stand upright from the start!